130 mm/55 Model 191315 х 1 pcs. Initial AP Shell Velocity823 m./s. 63.3 mm Model 19164 х 1 pcs. Initial HE Shell Velocity861 m./s. Initial AP Shell Velocity861 m./s. 76.2 mm Lender gun9 х 1 pcs. Svietlana — Soviet Tier IV cruiser. The first light cruiser with turbine propulsion, laid down for the Imperial Russian Navy. Svietlana was notably faster than her predecessors. Her armor protection and weapons were quite good for her time. The ship's artillery was remarkable for its long range and strong ballistic properties. Svietlana is a unique ship with many interesting qualities that make her stand apart from her tier 4 rivals. Most noticeably she has numerous 130 mm guns as her main battery armament - the caliber later seen on higher tier Soviet destroyers. She can fire eight of these guns per broadside, the most of any Tier IV cruiser. In addition, swinging the bow of the ship back and forth can bring almost all the guns to bear on a target you are charging at, as well as making yourself hard to hit. 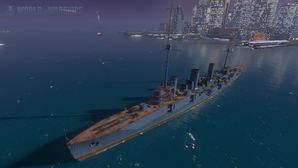 The downside for the cruiser though is the poor reload time, unlike the other cruisers for it's tier. The AA weaponry is also for show and will rarely shoot down any aircraft. The placement of torpedoes is also something to be aware at, due to the fact that their placement is way at the back of the ship and exposes your entire broadside when attacking. This allows the enemy easy citadel hits. Excellent shell ballistics (high shell speed and flat arcs). Good concealment despite being the largest cruiser at Tier IV. Low caliber guns (130 mm) enable this ship to benefit from Basic and Advanced Firing Training captain skills as well as full benefit (+2.5°) from Expert Marksman. Can equip Hydroacoustic Search ( ) once Hull (B) is mounted. Slow reload time for a Tier IV cruiser. Poor torpedo damage, speed, and range. Second slowest Tier IV cruiser. Placement of torpedo launchers, means you must expose your broadside to most enemies. Krasnyi Krym (Russian: Красный Крым - Red Crimea) was a light cruiser of the Soviet Navy. She was laid down in 1913 as Svetlana for the Imperial Russian Navy, the lead ship of the Svetlana class. She was built by the Russo-Baltic Yard in Tallinn, Estonia and launched in 1915. Her hull was evacuated to Petrograd when the Germans approached the port in late 1917 and laid up incomplete during the Russian Revolution. The ship was completed by the Soviets in 1926. During World War II she supported Soviet troops during the Siege of Odessa, Siege of Sevastopol, and the Kerch-Feodosiya Operation in the winter of 1941—42. Krasnyi Krym was awarded the Guards title on 18 June 1942. The ship was reclassified as a training ship in November 1954 before being scrapped in July 1959. Svietlana is currently depicted as she would have appeared in pre-revolution configuration. She never saw service with the Imperial Russian Navy. See Krasny Krym for the historical version. The 76.2 mm Lender gun configuration is fictitious. This page was last modified on 18 February 2019, at 18:26. This page has been accessed 30,035 times.